Here you'll find information about BISS Champion Cheshire's Tailor Made V. Longo and Cheshire Danes which is based in eastern Tennessee. 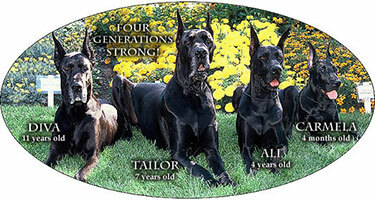 We show and breed exceptional quality black Great Danes. Great Dane Puppies! Sorry we have no puppies available at this time! 09 /08/2018 Milan becomes a Champion!Milan wins WB/BW for a 5 pt. major in Biloxi Mississippi. Milan is a Tonka grandaughter and was bred by Kia Makipelto! Thank you to Kia and to her handler Linda Cain who handled her so beautifully!